, an English poet, was born in Aldersgate-street, London, about 1633; and educated at Winchester school. He went from thence to New college, in Oxford; but leaving the university without a degree, he removed to the Inner Temple, where in due time he became a barrister. Jt does not appear that he ever followed the profession of the law; but, having a turn for the fine arts, he indulged his inclination, and made some proficiency, both as a poet and a painter. 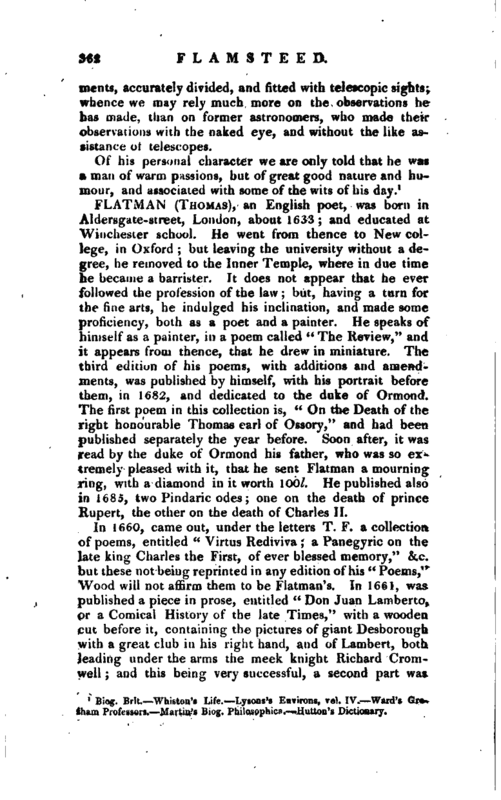 He speaks of himself as a painter, in a poem called “The Review,” and it appears from thence, that he drew in miniature. The third edition of his poems, with additions and amendments, was published by himself, with his portrait before them, in 1682, and dedicated to the duke of Ormond. The first poem in this collection is, “On the Death of the right honourable Thomas earl of Ossory,” and had been published separately the year before. 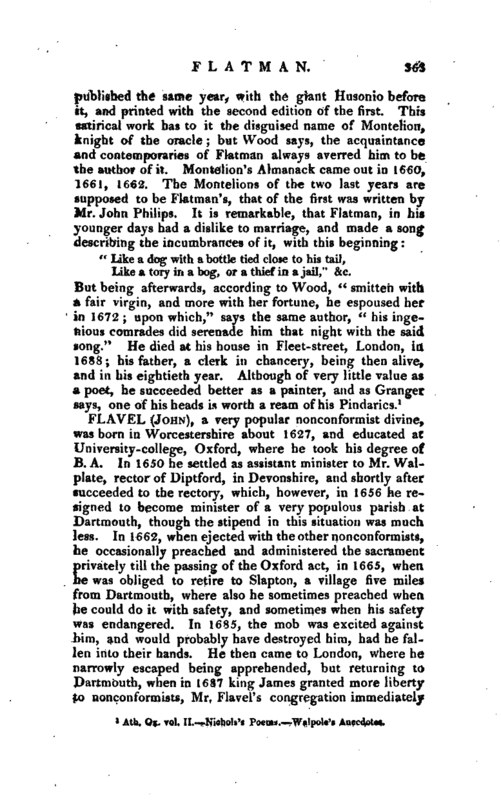 Soon after, it was read by the duke of Ormond his father, who was so extremely pleased with it, that he sent Flatman a mourning ring, with a diamond in it worth 100l. He published also in 1685, two Pindaric odes; one on the death of prince Rupert, the other on the death of Charles II.